Updated on 2017-12-03 – As you may already know, bettas are not maintenance-free fish. Yes, they are pretty easy to take care of, but they do require a little bit of TLC. Part of that care, is making sure that their “home” is nice and clean. So, on to how to clean a betta fish tank. (Note: This post will focus more on the smaller betta tanks, such as bowls and or other non-filtered tanks. Eventually, I’ll post more information on how to take care of the bigger tanks. A day before you plan on cleaning your tank, fill up a bowl or other container with enough water to replace the water in your betta fish tank. You are doing this to make sure that the water is room temperature before adding it to your tank. (They usually like a range of 72 – 82 degrees, so if you currently have a small heater in the tank, I suggest you try to get the water at the same temperature as is currently in the tank). The day after, when you are ready to clean your tank, start by treating the new water with betta conditioner. (Make sure you follow the instructions on the bottle!). At this point, I normally check to see if the PH levels are ok. Anywhere between 6.5 and 7.5 is ok, but 7 is ideal. 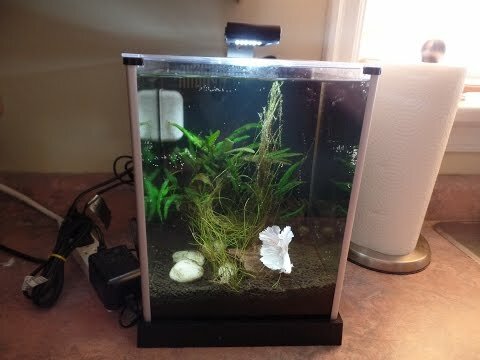 Pour about 1/3 of the water from your betta fish tank into a 2nd container and move your betta fish to that container. Empty the betta tank and rinse everything off (substrate, decorations, etc.) under running water, then put everything back into the tank. (Note – Some people wash their betta tank with soap, but I normally try to avoid that if possible. You can’t guarantee that you will get 100% of the soap off and soap may harm your little guys. Instead, just try scrubbing your tank with a regular aquarium brush to get most of the dirt off. Once everything is back in, fill up the tank with the new conditioned water, wait until the dust settles a bit and then move your betta fish back to their home. That’s it! Keep in mind that not all tanks are the same and not all filters are the same. I added this video to give you an idea on what’s involved in cleaning a tank, since I’m a visual person and often prefer to see how things are done instead of reading about it. So know you should know how to clean a betta fish tank. How often do you have to do it? For the smaller tanks that don’t have a filter, I would say at least on a weekly basis. Larger filtered aquariums can normally be done every 2nd week or so and you would normally only perform a water change, not a complete empty & cleaning since the filter takes care of a lot of cleaning. Before you leave, I highly recommend that you read about the various betta fish diseases that could affect your betta at some point. It’s better to have the knowledge ahead of time so you can react quickly. Until next time! Updated on 2017-12-03 – By popular demand, I updated this post to include a link to a great video that shows how to clean a betta fish tank. Not sure why anyone would want an aquarium without a filter…. I guess it might make sense if you are just starting out with a smaller tank and not sure if aquariums are something you are going to be interested in the long term so you want to start with a small setup. But I agree… filters do a great job at maintaining proper water conditions and the other bonus is that it is less maintenance in the long run. Thank you for this… I’m a newbie and wasn’t sure how to go about it.